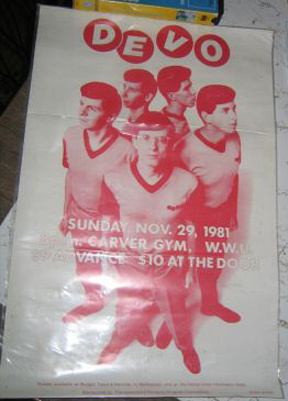 For DEVO's show at Sam Carver Gymnasium at Western Washington Univ. I think this poster/flyer is roughly 11" x 17". Maybe a little bigger? I already have a standard horizontal flyer, a standard vertical flyer, and a tabletop box flyer for this show...so I really need the poster to complete the set.